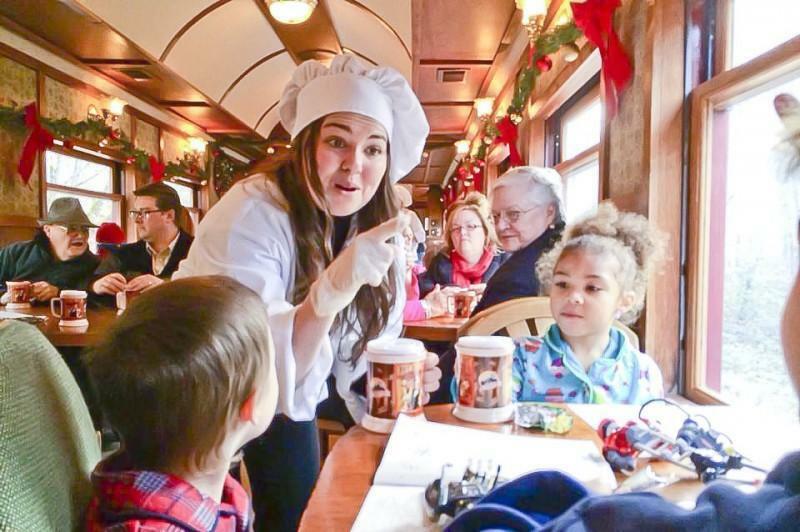 A chef serves hot chocolate to passengers aboard the Polar Express. Pop on your pajamas and pack up your imagination, and hop a train from Buzzards Bay to the North Pole. Not any old train either, but the Polar Express, the train made famous in the Warner Bros. movie of the same name. After a four-year hiatus, the Cape Cod Central Railroad has reintroduced the Polar Express to Massachusetts. Until Dec. 23, a vintage car is specially decorated in blue-and-gold garland and lights to replicate the movie’s splendid carriages. Also, characters from the movie, including the hobo, conductor, and the dancing chefs and waiters are on board. Not only did the national company return to the Polar Express train, but CCCR decided to pull out all the stops, so to speak, for an even better experience. The capacity is also expanded, with more than double the number of seats, about 550. New this season, too, is the sleek, space-age dome car, borrowed from the company’s sister train in Saratoga. The journey takes an hour total and begins at the station in Buzzards Bay. The movie’s soundtrack plays as the dancing chefs and waiters parade through the train. They stop jiggling about to deliver hot chocolate and a cookie to every passenger. Then, the music switches to actor Liam Neeson’s narration of “The Polar Express,” which was written and illustrated by Chris Van Allsburg and published by Houghton Mifflin in 1985. The chefs hold up giant copies of the book to show the drawings. Bring your own if you want to read along; or order one when you buy tickets and pick it up at the station. The big moment is when Santa Claus greets the Polar Express as it pulls into the station at the North Pole. Santa boards the train with his elves for the return trip. Santa being Santa, he doesn’t come onboard empty-handed. With help from his elves, Santa gives the First Gift of Christmas to every child on board. Then, the chefs and the conductor lead Christmas caroling on the 30-minute return trip. There’s a dress rehearsal open only to first responders on Nov. 12; proceeds from the discounted tickets goes to Homeless for the Holidays.